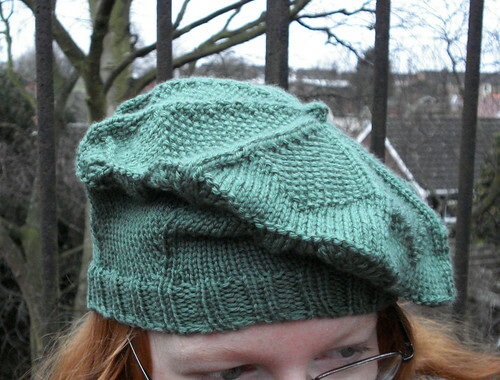 I'm working on a companion pattern to my Russell Square mitts, a tam/beret. It ends in 2x2 rib, so I decided to use a tubular castoff to give it a clean, elastic edge. When I began searching, I found that most tubular bindoffs are intended for a 1x1 rib, but a 2x2 variation does exist. The first way to do it is to convert your 2x2 ribbing into 1x1, and work a tubular BO as normal. That technique is covered here. The second is a true 2x2 tubular ribbing bind off. I first found it on pages 22-23 of Knitting Tips & Trade Secrets by Mary Galpin Barnes, and you can find it in the Google Books preview for the book, with pictures. This is probably the best way to learn it if you're a visual learner, like I am. There's also this post on craftster which describes the same technique very well in text, except I think she may have forgotten the step of drawing the yarn through purlwise on the second purl stitch.